"It’s been a blockbuster year for announcements of mega condo projects in Toronto. Metro looks at three major developments that are bound to transform the urban fabric of their respective neighbourhoods. At the southwest corner of Bloor and Yonge streets, the iconic gateway to Yorkville and the Bloor Street shopping district, a proposal is underway to construct an 80-storey mega-tower. Next to the CN Tower, this will be the tallest building in Canada. The One, as it is called, will consist of a combination of condominium residences and retail at street level. Mizrahi Developments purchased the property, which for more than 100 years served as the site of the former Stollerys clothing store. The building will be designed by high-profile architect Norman Foster and will feature a distinctive exoskeletal design. Further west along Bloor at Bathurst Street is another major development proposal. The entire corner block at the former site of Honest Ed’s discount store is slated to be transformed into an urban village. Further west along Bloor at Bathurst Street is another major development proposal. 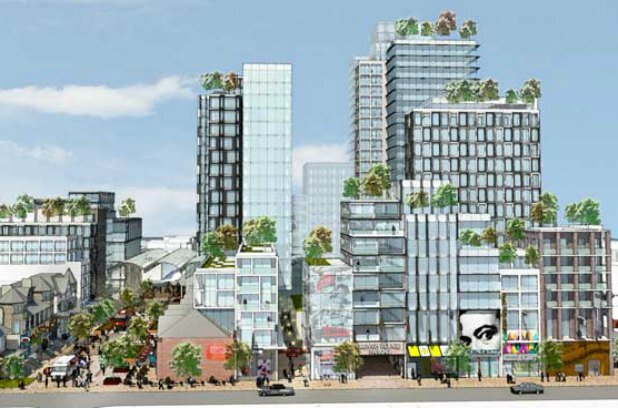 The entire corner block at the former site of Honest Ed’s discount store is slated to be transformed into an urban village."